This ideal first dictionary contains over 1,500 core words from alligator to zipper, carefully selected to complement the books that children of this age are beginning to read. The clear definitions and sample sentences are enhanced with realistic photos and artwork that help bui... read full description below. 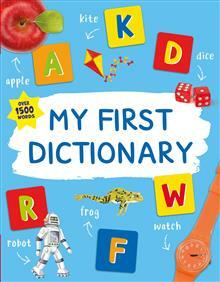 This ideal first dictionary contains over 1,500 core words from alligator to zipper, carefully selected to complement the books that children of this age are beginning to read. The clear definitions and sample sentences are enhanced with realistic photos and artwork that help build the child's comprehension and reading readiness. Angela Crawley contributed to The Kingfisher First Dictionary from Kingfisher.